bring the equally broken Monkees luck�unfortunately all bad! "Words" Written by Tommy Boyce & Bobby Hart, Produced by Chip Douglas. At a club, the manager watches The Monkees' playing and singing "Goin' Down," for an audition. Impressed, he hires them and fires Mendrek, a broken-down magician who's been employed there for 12 years. Later that day, The Monkees offer Mendrek sympathy as he's packing up his things. When Micky notices a monkey's paw, Mendrek tells them that it's a charm that will grant them 3 wishes. Then in flashbacks, relates how he came to have it with Micky as a young Mendrek climbing the mountains in Tibet in the snow searching for the unknown to find The High Llama, only to come across The Regular Llama (Michael) since The High Llama is sleeping it off (they don�t call him High Llama for nothing!). Then Regular Llama ends up giving in him a magical monkey's paw. Back in the present, Micky decides to buy the it from Mendrek for $0.25. Back at the pad, Micky has been on the phone talking to the union who say they can't work unless they pay their dues, but the problem is they need to work in order to get the money. Micky wishes on the monkey's paw for a way for them to get the money and soon the manager storms in their pad offering to pay their dues and take it out of their first week's salary but he insists on a 142% interest in exchange! At Mendrek's place, the magician informs his daughter that he sold the monkey's paw to the quartet. She reminds him of the paw's curse, but the magician feels that, having rid himself of the paw, his luck should immediately change�and he suddenly wins $1 million in an over-the-phone contest! Meanwhile, the guys complain of hunger, so Micky wishes for a big spaghetti dinner and is immediately deluged with spaghetti ("Well, I didn't wish for how it should be served!"). Later, backstage at the club, Micky, completely hung up over the paw, tries to think of another wish and, as they're prepared to go on, unwittingly wishes he would stop talking and loses his voice (giving a whole new meaning to the phrase "be careful what you wish for"!)! The Monkees perform "Goin' Down" again, but Micky isn't able to sing, and the audience boos at him lipsynching over the backing track. When the manager demands to know what's going on, the boys, to cover up, explains Micky is singing with his feet, but to no avail. Michael is sure the boys are in a lot of trouble when the manager threatens to fire them if Mick isn't singing by tomorrow morning. At the pad, the guys try to convince Micky that he can talk as he tries to recite The Gettysburg Address but he remains speechless. Remembering that the trouble all started when Mendrek sold them that monkey's paw, the guys head over to his place; there they are surprised to find the now-rich magician wallowing in luxury and business deals offered to him over a plethora of phones on his desk. They question them about the Monkey's paw while assisting him in answering the phones but he avoids there questions by continuing to busy himself with the phones until they all give up. Back at the pad again, the guys try to analyze what is wrong with Micky and believe him to be sick and the solution is chicken soup (in which they bathe him in!). A half-a-day later of non-speaking, the boys decide that, in 12 hours, Micky simply forgot how to talk, and they soon give him lessons in speech by trying to make him to say �pencil,� but the only word he can say is �crayon.� Next, they conclude Micky has a mental problem and take him to a psychiatrist. However, when he attempts to give Micky a Rorschach test, the guys keep interfering with their opinions causing the impatient psychiatrist to end up going crazy and kicks them all out. That night, the boys attempt to salvage what remains of their act by incorporating Micky�s silence into it; they run through an old Marx Brothers act (with Michael as Groucho, Micky as Harpo [silent, get it? ], and Peter, Chico), but the unimpressed manager still fires them. Then they decide to see Mendrek again who no longer has phones on his desk since he's giving up show business and is devoted to helping the needy. The guys explain to him about Micky�s problem, so he sends David and his daughter to go to the library to find the book of mystery in order to break the spell while he works on Micky using the pocketbook edition. David and the manager�s daughter look through the book where David is briefly distracted by her beauty, while Mendrek uses different kinds of torture to break the curse from tickling him with feathers to using a gong but Micky remains mute. Finally, David and the daughter find the solution in the book that reveals that Micky has to sell the monkey�s paw to somebody else to reverse the curse, but Michael tries to think of someone deserving of the charm, meaning someone nasty. The manager shows up to offer Mendrek�s job back and Michael realizes they have their pigeon. Mendrek tries to convince him to buy the monkey�s paw revealing the magic powers it has which he can use to do all his magical tricks and demonstrates to the musical romp "Words" . So impressed is the manager that he buys it for a quarter, immediately wishes for a million dollars and is deluged with cash. Then the taxman comes to arrest the manager for tax evasion and drags him off. At the end of the show, Micky�s voice is restored and he talks non-stop until stopped by Michael just as The Monkees give a wrap-up to the audience by singing the Monkees theme song. An outtake from this episode wherein guest Hans Conried exhumes frustration with the boys' on-the-set shenanigans; Peter airs his feelings about the demise of the hippie movement in the 12th and last end-of-show Monkees interview segment of the series. The "Words" musical number incorporates scenes from Peter's The Astonishing Pietro act in Episode No. 15, “Too Many Girls” (a.k.a. "Davy And Fern"). “The Monkee's Paw”'s original storyline reveals a former conclusion to involving Peter, having found a small box, being warned by Mendrek that he'll turn into a chicken should he open it. Michael scoffs at this nonsensical fluff; then Peter turns into a frog! Also, when The Monkees wish their union dues were paid, the manager originally advanced the money @ 100% interest. Other scenes shown in the synopsis but deleted include David, Peter and Michael moving Micky's face with their fingers (while bathing him in chicken soup), and the crazy psychiatrist being removed in a straitjacket. The storyline also neglects to list “The Monkee's Paw”'s author, Coslough Johnson. “The Monkee's Paw's” submain title theme was reused twice: for Episode No. 53, "The Monkees Race Again" (a.k.a. "Leave The Driving To Us"), and No. 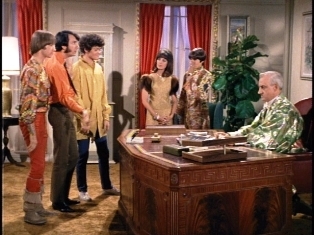 55, "The Monkees Mind Their Manor"; the theme was also heard twice in Episode No. 40, "Monkees Marooned", in the scene where The Monkees are hoisted in the net, and in the final scene where Peter reencounters Leonard Sheldon (Don Sherman) and confronts him on his selling him a phony treasure map. The slate of the outtake from “The Monkee's Paw” shown at its outset uses the same production number as Episode No. 36, "Monkee Mayor" (#4760). “The Monkee's Paw” is also the second of 2 Monkees episodes this season which featured hilarious episode outtakes in its tag sequence, following No. 46, "The Monkees On The Wheel", which used six takes of Michael and Micky from the previous episode, "The Monstrous Monkee Mash", as filler. “The Monkee's Paw” is one of 2 Monkees episodes this season which featured a "karaoke" mix of a Monkee song; the second is No. 57, "The Monkees Blow Their Minds" (which featured a "karaoke" version of "Gonna Buy Me A Dog"). Pisces, Aquarius, Capricorn & Jones, Ltd., The Monkees' fourth album, was released in the middle of “The Monkee's Paw”'s production. The maraca sound effect heard in the scene where young Mendrek (Micky) chokes The Regular Llama (Michael) is reconstituted in Episode No. 55, "The Monkees Mind Their Manor". It should be noted that, on the second day of production on “The Monkee's Paw”, November 14, 1967 (the same date of Pisces, Aquarius, Capricorn & Jones, Ltd.'s release! ), tensions between Peter Tork and David Jones erupted into an on-the-set slugfest, which sent Jones to Cedars-Sinai for stitches. A Monkee takeoff on the classic William Wymark Jacobs horror tale, The Monkey's Paw (1902). Mendrek The Magician is a take-off on the Lee Falk-created comic hero Mandrake The Magician. 2 Monkee stand-ins also have unbilled cameos here: David Pearl cameos as one of the nightclub patrons (you can't miss him; he's seated in the table up front), and David Price, a janitor. All of the psychiatrist scenes were filmed on the set previously used as J.B. Guggins' office in "Monkee Versus Machine". Michael also wore that orange necktie in Episode No. 46, "The Monkees On The Wheel", just like he previously wore that orange shirt in in No. 3, “Monkee Versus Machine”, No. 12, “I've Got A Little Song Here”, and No. 29, “The Monkees Get Out More Dirt”. The Monkees change their clothes 3 times throughout this episode. Here is another rare occurence on the show which sees David Jones playing the drums. Previous occurrences are in the “Words” musical sequence in Episode No. 30, “The Monkees In Manhattan” (a.k.a “The Monkees Manhattan Style”), part of the live concert at The Coliseum in No. 32, “The Monkees On Tour”, and this season's musical numbers for “Randy Scouse Git” and “Love Is Only Sleeping”. At the start of the fantasy sequence featuring Michael as The Regular Llama and Micky as young Mendrek, a musical sting which will ultimately become the submain title of the next episode, "The Devil And Peter Tork", can be heard. Also, as Micky relates his long and sad story to Michael, listen as an Eastern-lilted cue originally heard in Episode No. 35, "Everywhere A Sheik Sheik", is played. Two legendary NBC shows are given mention in “The Monkee's Paw”: You Bet Your Life (a.k.a. The Groucho Show, NBC, 1950-61), and The Tonight Show Starring Johnny Carson (NBC, 1962-92). Trivia Footnote: The Monkees [sans Peter Tork] later made a June 16, 1969 appearance on The Tonight Show—along with their new backup band, Sam & The Goodtimers—to plug The Monkees Greatest Hits [Colgems #COS-115, issued 6/14/69].) Another reference to Johnny Carson's Tonight Show is made in Episode No. 54, "The Monkees In Paris" (a.k.a. "The Paris Show"). To lip-readers, note a voiceless Micky forming the words of, but not saying, The Gettysburg Address. Michael Nesmith can be heard saying its first line in Episode No. 40, "Monkees Marooned", in the scene where he, Kimba (Burt Mustin), Thursday (Rupert Crosse), and his fellow Monkee mates are ordered to spit out their last words at gunpoint by Major Pshaw (Monte Landis). The cigarette girls in the nightclub wear maid's outfits that are similar to that which was worn by Della The Decoy (Sharyn Hillyer) in "The Monkees On The Wheel". In the scene where Micky is deluged in spaghetti, what you see is not real spaghetti, but actually small, frayed pieces of string. Michael Nesmith makes a swipe at an old movie as he, along with Peter Tork, explains Micky's "singing with his feet" to The Manager (Henry Beckman): he quips, "Haven't you heard of the movie Young Man With A Corn?" Actually, Michael means Young Man With A Horn, the 1950 Warner Bros. movie musical drama which starred Kirk Douglas and Lauren Bacall; Papa Nez obviously altered the title a bit to make it fit with the motivation. And Peter refers to "Flat Foot Floogie (with a Floy Floy)" (also "The Flat Foot Floogee"), which is a 1938 jazz song, written by Slim Gaillard, Slam Stewart, and Bud Green, and performed by Gaillard and Stewart as Slim & Slam. In the tag interview segment, David Jones flaunts his love beads and says, "I'm not a hippie...Charlie bought me these!" He's talking about Monkee roady Charlie Rockett, who, along with Jones, Kim Capli and Eddie Brick, composed the tune "Hard To Believe," which was the introductory track on Side B of Pisces, Aquarius, Capricorn, & Jones, Ltd.. He would also compose with Michael Nesmith the tune "Magnolia Simms," a staple on The Birds, The Bees & The Monkees. Rockett will be seen as a Gendarme in Episode No. 54, "The Monkees In Paris" (a.k.a. "The Paris Show"). David's quote from "The Monkee's Paw"'s interview session, "Don't hit me with a stick, please!," was an inside joke between the two of them, where Peter would pretend to 'hit' Davy with a stick. (He did this in the "Daily Nightly" romp and in the "No Time" romp.) This joke is based off of the acts of the notorious Russian Tsar, "Peter" The Great, who used to punish many people in his kingdom by hitting them with sticks. This is the third of four occasions which Micky is referred to as "fuzzy," owing to his new "Afro" hairdo. Previous occasions can be found in Episode No. 39, "Hillbilly Honeymoon" (a.k.a. "Double Barrel Shotgun Wedding") and No. 42, "The Wild Monkees"; in the 1968 Monkees movie HEAD, Officer Faye Lapid (Logan Ramsey) calls Micky "Fuzzy-Wuzzy!". In the scene where Mendrek prepares to treat Micky to his gong, he says, "By the third gong, you'll hear a scream." But the word "scream" was originally lost on the original 35mm 3-stripe magnetic film track of this episode, treating viewers only to the sound of Michael and Peter's knuckles cracking as they cross their fingers. However, as “The Monkee's Paw” was upgraded for distribution in syndication (and MTV repeats) in the mid-1980s, thanks entirely to the magic of a 1/4" analog master tape, the word "scream" was finally heard. The late Hans Conried (Mendrek) was in great demand as an actor, panelist and narrator, appearing frequently in television series and movies throughout the 1960s and '70s, including the voice of Captain Hook in Disney's Peter Pan (Buena Vista, 1953) and a couple of stints at Jay Ward Productions as the host of Fractured Flickers (Syndicated, 1963) and the voice of Snidely Whiplash on The Dudley Do-Right Show (ABC, 1969-70). Unfortunately, Conreid was not too adaptive to The Monkees' off-the-wall antics inbetween takes, as the outtake from “The Monkee's Paw” (shown at the beginning of its tag) attests. In his 1993 biography, I'm A Believer, Micky Dolenz gives mention of the Hans Conreid outburst ... something which he has since regretted provoking. The late Severn Darden (J.B. Guggins from Episode No. 3, "Monkee Versus Machine") has an unbilled cameo as the psychiatrist (though Screen Gems' original plot synopsis for this episode lists him). Among many film & TV roles, Darden appeared as Pepito in Mary Hartman, Mary Hartman (Syndicated, 1976-78). (Another Mary Hartman, Mary Hartman regular, Susan Browning [Pat Gimble], was previously seen as Ellen Farnsby in Episode No. 28, “The Monkees On The Line”.) With Monkee semiguest Monte Landis, Darden appeared in the 1985 Tri-Star romp Real Genius, which starred Val Kilmer. The late Henry Beckman, seen here as the ruthless Manager, was also the ruthless D.A. in Episode No. 34, "The Picture Frame" (a.k.a. "The Bank Robbery"). He was previously seen as Col. Douglas Harrigan in the final season of McHale's Navy (ABC, 1962-66), which also featured Monkee guest actors Jacques Aubuchon (“The Spy Who Came In From The Cool”) and Carl Ballantine (“Find The Monkees” [a.k.a. "The Audition"]) in recurring roles. Beckman appeared in the 60-minute Sept. 7, 1967 pilot episode of The Flying Nun (ABC, 1967-70), was previously seen with Monkee guest alum Arch Johnson (“The Chaperone”) in a January 4, 1968 episode of Bewitched (ABC, 1964-72), "Once In A Vial," and later appeared in a November 4, 1968 episode (exactly 11 months later!) of I Dream Of Jeannie (NBC, 1965-70), "The Used Car Salesman," with another Monkee guest star (and former McHale's Navy costar) Carl Ballantine (“Find The Monkees” [a.k.a. "The Audition"]); he would also play Capt. Charley Clan on Here Come The Brides (ABC, 1968-70), which starred Monkee guest actor Bobby Sherman (“The Monkees At The Movies”). Beckman passed away on June 17, 2008 at age 86. Jack Fife (Taxman) previously appeared with Monkee guest alum Larry Gelman (“I've Got A Little Song Here”, “Captain Crocodile”, "The Monkees Christmas Show") in a 2-part November 14-21, 1966 episode of I Dream Of Jeannie, "The Girl Who Never Had A Birthday," and later appeared with another Monkee guest Ceil Cabot (“The Royal Flush”, “The Success Story”) in a December 21, 1967 episode of The Flying Nun (ABC, 1967-70), "Wailing In A Winter Wonderland."